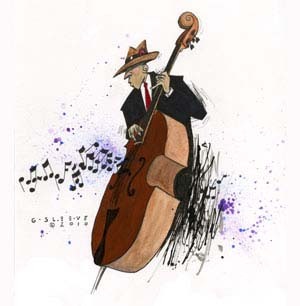 Home > G-sleeve Art > "World of Jazz" Prints by David > "Bass Fiddle"
The "Bass Fiddle" print comes from David's World of Jazz Series, and it complements others in the series. They are often purchased and displayed together to project a great musical scene for the jazz enthusiast. As an instrument in jazz bands dating back to the early 20th century (often associated with New Orleans), the bass provides a steady beat and the root notes of the chords of the tunes upon which the soloists construct their inventions, melding together rhythm and harmony in one function.